Most wholesale distributors manage inventory planning in offline tools such as Excel. This process is time consuming, prone to errors and is hardly real-time planning. But can inventory planning and optimization be a perfect match for the Cloud? Inventory optimization solutions built in the cloud are ideal for any size business looking to increase inventory visibility, availability and profits. "Cloud computing has a significant potential impact on every aspect of IT and how users access applications, information and business services." 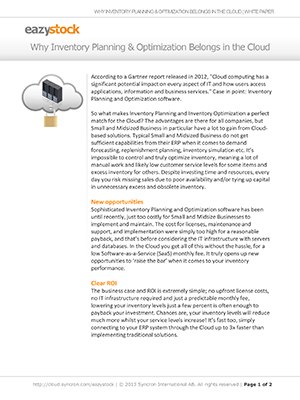 Download the white paper to learn more about cloud-based inventory optimization solutions.